Today sees the launch of the new Rock & Pop 2018 syllabus, for exams starting 1 January 2018. 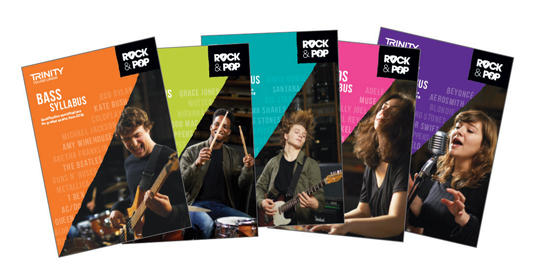 The brand-new syllabuses, now in separate booklets for each instrument (Bass, Drums, Guitar, Keyboards, and Vocals), are available to download from the new Rock & Pop website at: trinityrock.com. Putting performance first and encouraging musicians to learn by playing the songs they know and love, the 2018 syllabus has new song lists with hundreds of well-known songs from artists including Adele, David Bowie, The Beatles, Foo Fighters, Taylor Swift, Nirvana, Stevie Wonder, Daft Punk, Led Zeppelin, Sia, Oasis and many, many more. And it doesn’t just stop at the syllabus. There are new songbooks now with eight songs in each, plus performance tips, background information, and downloadable backing and demo tracks; a huge range of online support resources including videos with insights into the new syllabus, advice from the music industry, demonstrations of techniques from professional musicians, and downloadable resources to use in the classroom; and – we’re very excited to announce – a brand-new practice app, putting learners behind the controls of their very own mixing desk.